Also available: Chime Enhanced, JMol, and VRML versions. 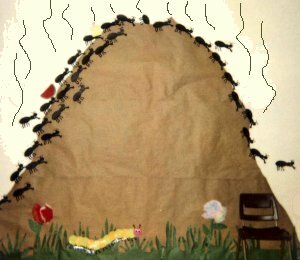 For over 600 years naturalists knew that ant hills gave off an acidic vapor. In 1671, the English naturalist John Ray describe the isolation of the active ingredient. To do this he collected and distilled a large numbers of dead ants, and the acid he discovered later became known as formic acid from the Latin word for ant, formica. Its proper IUPAC name is now methanoic acid. The first synthesis of formic acid was by the French chemist Joseph Gay-Lussac, who used hydrocyanic acid as a starting material. In 1855, another French chemist, Marcellin Berthelot, developed a synthesis from carbon monoxide that is similar to the one used today. Formic acid is also present in a natural state in stinging nettles, and is is reponsible for the burning feeling on contact with them. 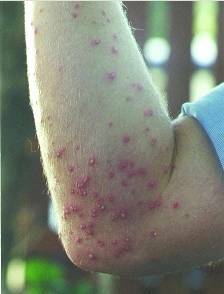 It is also found in the stings and bites of many insects, including bees and ants, which use it as a chemical defence mechanism. When the ant contracts its poison gland, the formic acid stored in this gland passes in the sting and is propelled out in jets (up to a distance of one metre in some species!) toward the attackers of the ant. Since formic acid has a pH of ~2-3, the attackers usually flee, or are killed. The chemical formula of formic acid is HCOOH, and it is a planar molecule. Formic acid is a colourless, fuming liquid that is miscible with water. In the vapor phase, it consists of hydrogen bonded dimers (see picture, right) rather than individual molecules. In the gas phase, significant deviations from the ideal gas law arise as a result of this hydrogen bonding. In its liquid and solid state, formic acid can be thought of as an effectively infinite network of hydrogen bonded molecules. Being the first in the carboxylic acid series, formic acid shares most of the same chemical properties, and so it will react with alkalis to form water soluble formate salts. But formic acid is unique among the carboxylic acids in that it reacts with alkenes to form formate esters. In the presence of sulfuric and hydrofluoric acids, a variant of the Gatterman-Koch reaction takes place instead, and formic acid adds to the alkene to produce a larger carboxylic acid. The main use of formic acid is for livestock feed in Europe, as a preservative and antibacterial agent. It can be sprayed on fresh hay or other silage to stop or delay certain decay processes. It therefore allows the feed to survive longer, and so it is widely used to preserve winter feed for cattle. In the poultry industry, it is sometimes added to feed to kill salmonella bacteria. Some beekeepers also use formic acid as a fumigant to kill a mite which attacks the bees. Formic acid is used in textile dyeing and finishing, leather tanning, nickel plating baths, electroplating, coagulating rubber latex, regenerating old rubber, and dehairing and plumping hides, and in some commercial paint strippers. It is used to make metal salts, including nickel, cadmium, and potassium formates. It is used as a solvent for perfumes, and in the manufacturing of lacquers, glass, vinyl resin plasticizers, and formate esters for flavor and fragrance. It is used in the synthesis of the artificial sweetener, aspartame.